As if you needed another reason to ditch cable in 2011, it looks like prices are going up at some of the biggest providers. 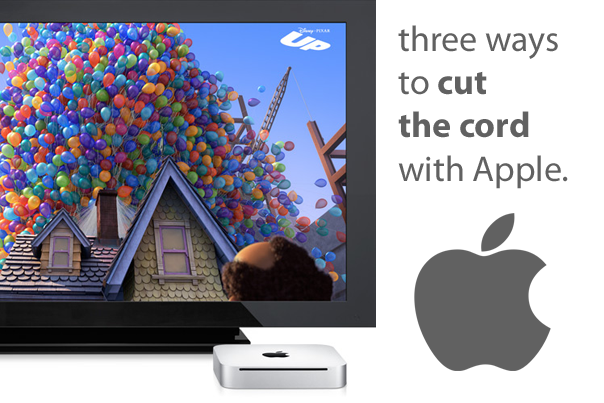 So if you’re finally tired of getting fleeced, here’s how to cut the cord and go cable-free the Apple (s aapl) way. You even have more options than you did the same time last year, too. This is the most powerful and versatile option, but it’s also among the most expensive. You can get away with spending relatively little by using a Mac mini. The idea is to set up a Mac computer connected to your TV as a media centre. The Mac mini is perfect if you want to dedicate a computer entirely to this task, thanks to its small form factor and HDMI port. If you’d still like to use your computer as a computer, too, then getting a Mac notebook might be a better solution. The benefit of using a Mac is that you have all of the power of a full desktop computer. That means you can browse the web, access Flash-based video sites (Hulu, network sites), and even play full-featured video games using USB or wireless game pads if you like. You can also use Boxee, XBMC or Plex (media player and organization apps) to make your Mac more easy to control and navigate with a remote in a home theater setting. You can use Netflix (s nflx) on your Mac using the web interface, but there are better ways. Boxee has a Netflix app, for example, which makes it far easier to control. There’s also possibly a native Mac app in the works from a third-party developer, and Netflix itself might get in on that game when the Mac App Store launches next week. Hardware Required: Mac, HDMI or VGA cable (depending on which port your TV has available), Mini DisplayPort-to-VGA adapter (if you’re using a Mac other than the Mac mini). Advantages: Full computer at your disposal, supports Flash. Ideal for: The advanced Mac enthusiast who wants to have it all. Using an iPad to cut the cord is probably the easiest option to overlook, but it’s also among the simplest. It can even provide HD output via the dock connector-to-VGA peripheral, though using the Apple Component AV cable will only provide standard definition video. The iPad is also limited in terms of content sources. Obviously, it won’t play Flash content, and not all apps provide video-out support. Hulu Plus is a notable example of one that doesn’t. Some very crucial ones do, however, like Netflix. If you purchase or rent most of your video content through iTunes, though, the iPad will work well for you. Finally, remember that controlling your iPad while watching video through your home theatre system could be quite awkward, and the device will have to remain tethered to your TV if you don’t have an Apple TV to stream to. But the iPad is a good choice if you’d like to also be able to take your media with you and access it on the go. Hardware Required: iPad, Dock Connector to VGA Adapter, Apple Component AV Cable. Advantages: Also a standalone portable solution. Ideal for: The infrequent TV-watcher who spends most of his/her time out of the house. The new Apple TV is a great option for Apple cord cutters, since it’s small, cheap, and easy to set up. It provides access to iTunes rentals and Netflix, and it provides HD quality video (720p). If you’re not really amazing at using OS X, and you want a set-it-and-forget-it solution, this is the way to go. It’s even quite portable, since it’s so small and only requires two cables, as I’ve proven many times by taking my own when visiting friends and family. Apple TV does have some downsides to consider. Unlike the Mac and iPad, there’s no way to browse the internet from the device, which could limit your content sources. In fact, as of right now, you’re only able to get video from Netflix, YouTube, and iTunes, unless you’ve stored your own content on a computer attached to your local network in an iTunes-friendly format. Flash video isn’t anywhere near an option, unless you go the jailbreak route. Also unlike the Mac and the iPad, you won’t be able to store any media locally on the device, so you can only watch what you can stream from other sources. If you have an iOS device, AirPlay provides another reason to consider Apple TV. You can stream content from your iPhone, iPad or iPod touch (providing you’re using iOS 4.2) from your device to your Apple TV easily, although the type of content that can be streamed is limited to YouTube videos, local videos synced from iTunes, pictures and music. Hardware Required: Apple TV, HDMI cable, optical audio cable (optional). Advantages: Portable, cheap, easy to add to an existing home theatre setup. Ideal for: Average Mac user who wants to primarily use Netflix and the iTunes store for content. Any other tips or ideas for ditching the cable subscription with the help of your Mac and Apple devices? Why not just cut the cord, turn off the computer, and take the kids out on a hike, a bike ride, a picnic, a swim, or the sort of activities that are FREE and give you the best reward, HEALTH? Well…to put a nail in their coffin our local cableco, Frontier FiOS, just announced a 50% rate increase! (http://bit.ly/hibsPN) There were huge concerns about Frontier’s acquisition of Verizon last July due to severe under capitalization and no experience in the FiOS business. They made numerous promises to the government agencies to get approval for the acquisition which they have broken at every turn. It looks like the fears were valid as service has gone into the tank and they are running out of money. Once our “protected” pricing runs out this year we’re done with Frontier. Glad I began planning for the switch a while back! Since we live far from both Grandmas, we went the Mac Mini route. Never has Skype looked so good (using Dell before). We can play all our iTunes content, buy new content (rather than renting with new Apple TV), and have an option for showing our edited home movies. I’ve heard streaming looks good with the new ATV, but who wants to run upstairs to turn on the computer. Or have to pick the right device when all the computers are on? The HDMI output on the new Mini made it a clear choice. So far this year (or last as the case may be) We have been happy with all the hardware updates. Especially the Air and Mini. I have cut the cord, The Roku box many channels including netflix and hulu plus I have total subscriptions of $22.00 per month an antena gets me seven local channels, the kids love the programming and finally I am free. I tried this eight months ago – the content isn’t there. Like Scott, I can’t afford iTunes, so I was searching network sites and feed sites for the half-dozen shows my family and I watch. It was very difficult to enjoy the experience … and my wife and son didn’t have the patience to do it, either. In the end, cable and satellite providers make it easy, that’s why I keep paying them. I just pulled our Mac Mini dedicated HT computer and replaced it with a new Apple TV2. Running a computer from the couch is cumbersome at the very least and cruising the web on a big-screen plasma is not all it’s cracked up to be. I can stream archived movies, TV and photos from my iMac or my iPad even more easily. Netflix looks great and even more programming as well as apps are in the wings for the Apple TV. With the content I can download/play our TiVo, our BR DVD player and our Apple TV I’m almost ready to sever all relations with our cableco. Once I install an antenna in the attic…done. And inexplicably, I still can’t get a bluetooth keyboard with a numerical keypad. I guess only people that use their computers for entertainment hate cords? It seriously pisses me off. Sadly, there are no options for cutting the cord that don’t result in major loss of content choice. We have an Apple TV and a Netflix subscription, and I’d happily cut the cord and go with just iTunes and Netflix content plus an antenna for local channels, but my wife and daughter aren’t sold yet. A lot of what’s hard to replace is kids programming. Netflix and iTunes are limited on that, and I can’t afford to rent a lot of stuff on iTunes regularly anyway. The whole point of cutting the cord is to save money. The worst argument against cutting the cord though is economics. The providers like Verizon, Comcast, Frontier, etc, want you to buy their internet & TV, or internet, TV, and phone bundles. Although it costs roughly $100 now for my Fios TV and internet, it will still cost $70 – 75 for just the internet if I cut the cord. They will basically double the cost of the Fios internet service to punish me for not keeping their TV service (95% or so of which I never watch). Until these companies and the TV networks are allowed real competition, or offer cheaper bundlers with fewer or ala carte channels, cutting the cord is going to be a relatively unattractive compromise for most people. Between a combination of Netflix and Hulu (or iTunes), I can replace anything that I personally want to watch. I was in the same boat economics wise. Was paying $60 for tv and internet from comcast, but was told if i dropped the tv part the internet price would increase by 50% making my bill $50. However, this last week I called and simply stated I don’t watch tv, but I love the internet, what can they do? He ended up allowing me to remove my tv package saving me $30, then increased my internet speed from 1mbps to 5mbps and lowered the price of the internet alone to $25 a month. So now I am paying $25 a month for 5mbps internet from comcast. Just throwing that out there to show that Comcast is willing to give you a good deal on internet without forcing you to bundle. Not sure why they wouldnt give me that deal 2 months ago, but will now. I hope You are kiding..There is absolutlely a ton of shows for kids of all ages..Go to netflix site and look under “children and family”. Broken down by ages and genres. From disney to nickolodeon..Wow what are your kids watching? Mickey Mouse Clubhouse & Imagination Movers are 2 of my kids favorites that are not on Netflix Instant. Special Agent Oso is another. Sure, Diego, Dora and Backyardigans are available, but kids don’t watch those as often.